Did you know you can find the answer to many Frequently Asked Questions (FAQs) via the Elsevier Support Center? Can I receive a desk copy of a book? Can I return my product and get a replacement or refund? 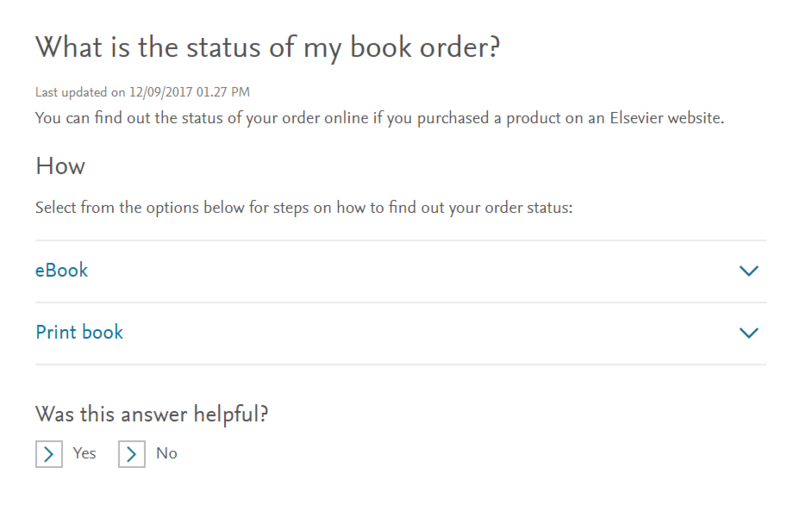 What is the status of my book order? What does the status of my submission mean in EVISE? Find a Support Center for FAQ’s or direct contact. How can I share feedback about the Support Center? Maybe you noticed something on the Elsevier Support Center that we could improve or add? Please share it with us on the Was this helpful? section that is available on each FAQ-page of Elsevier support center. Give a thumbs up or thumbs down to help us to improve our online support. We are constantly working to serve you quicker and smarter, so we really appreciate your feedback. How can I share feedback about the Elsevier website? Please use our website feedback form to share your suggestions about the website. How can I locate Elsevier offices? How can I file a complaint to Elsevier? If you're not happy, we're not happy. We try to get everything right first time, but we know that sometimes things can go wrong. If this happens, please let us know so we can put it right. We do our best to resolve problems as quickly as possible. We take every complaint seriously. Our EVP Global Operations and SVP Global Customer Service personally oversee all complaints. If you would like to contact us please use this Customer Complaint form. If you have an ‘Incident Reference number’ it would be great if you could include this in your complaint, it will help us to resolve your issue in a timely manner.